Perhaps one of the biggest mistakes that consumers make during or after filing bankruptcy in Orange County is to fall for credit repair scams. While it’s true that there are numerous legitimate agencies available that can assist consumers in repairing their credit, there are a large number of companies that prey on individuals who are experiencing credit issues. How does a consumer detect which credit repair agencies are real and which ones are scams? Claims to be Able to Erase Bad Credit: The only credit history that can be erased is that which is reported to the credit bureaus incorrectly, and you have the right to dispute that yourself for free. Accurate information can stay on consumers’ credit reports for up to ten years, regardless of what an agency may promise, and while disputing accurate information won’t send you to jail, reporting inaccurate information on a credit application very well could. Promises a New Credit History: Obtaining a new credit history is an illegal practice, and can result in criminal charges. Some Credit repair scams prey on individuals who have filed bankruptcy in Orange County, promising to give them a new credit history, when in essence, all they are doing is supplying consumers with stolen social security numbers or an EIN (employer identification number) to use in place of their actual social security number. Promises Immediate Repair: While we all wish there was a magic button that would repair our credit instantly, the truth is there simply is not. Credit repair takes hard work, determination, and time. The only legitimate way to repair credit is to make payments on time, establish new credit, and wait. Requests Fees up Front: Credit repair firms that charge fees up front are almost always scams. 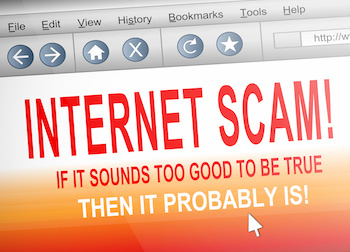 In many cases, they charge consumers fees, make lots of promises to provide credit repair services, and then disappear before the consumer has the chance to figure out that they are operating a scam. Does Not Provide a Copy of Consumer Credit File Rights Under State and Federal Law: One sure sign of a credit repair scam is if they do not provide the consumer with a copy of his/ her rights. Consumers have the right to obtain a credit report and to dispute inaccurate information themselves for free. If you suspect that you have become a victim of a credit repair scam, it is essential that you take action immediately in order to prevent others from becoming scammed as well. Report credit repair scams to your state attorney general, the Federal Trade Commission and the Better Business Bureau. By consulting with a legitimate bankruptcy attorney before, during and after filing for bankruptcy in Orange County, and obtaining knowledge and advice from a seasoned professional, consumers can help protect themselves from credit repair scams.